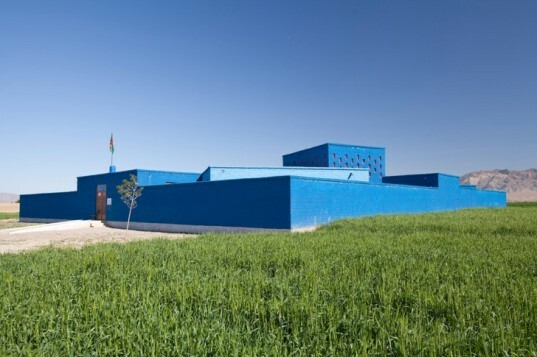 The Maria Grazia Cutuli Primary School in Herat, Afghanistan is an incredible example of school design in a war-torn area, and it has been shortlisted for the 2013 Aga Khan Award for Architecture. Designed by 2A + P/A, the bright blue complex is enclosed by a high boundary wall that provides additional safety. Designed to utilize natural lighting and ventilation, the school also has a garden, which doubles as a green classroom, giving students a modern and sustainable education. 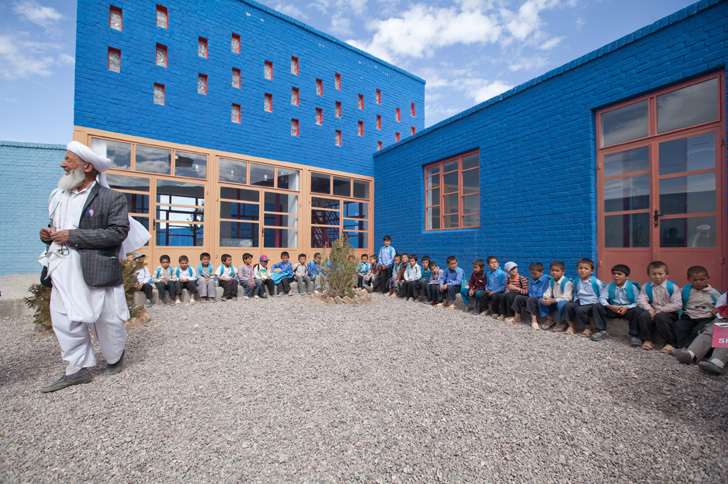 The innovative school was built as an homage to Maria Grazia Cutuli, an Italian journalist murdered in Afghanistan in 2001. The school’s designed is like a small walled village, giving students everything they need inside the complex, which not only helps to protect but is also necessary in the remote area. The rising brick and conrete wall and buildings were painted a rich blue, to emulate the lapis lazuli pigment in local pottery. Brick cladding covers reinforced concrete, to keep costs down, while also insulating the interior of the hot temperatures. Eight classrooms center around an interior courtyard, which is used for an outdoor classroom, recess and breaks. A garden brings a blast of greenery, but also serves as a green classroom, giving children a lesson in agriculture and sustainable farming. The central library is double height, allowing natural light to filter within through dozens of windows. The school acts as a safe haven for children in the war-torn country, providing a safe and innovative place to learn. The innovative school was built as an homage to Maria Grazia Cutuli, an Italian journalist murdered in Afghanistan in 2001. The school’s designed is like a small walled village, giving students everything they need inside the complex, which not only helps to protect but is also necessary in the remote area. The rising brick and conrete wall and buildings were painted a rich blue, to emulate the lapis lazuli pigment in local pottery. Brick cladding covers reinforced concrete, to keep costs down, while also insulating the interior of the hot temperatures.